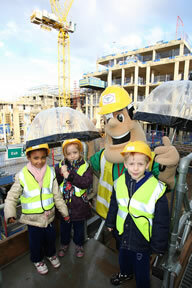 As part of a school project, pupils at Brandlehow Primary School geared up in hard hats and hi-visibility waistcoats for a fun and informative trip to Putney Square, Barratt West London’s leading development on Putney Hill. The Reception and Year 1 pupils are currently studying ‘Homes and Houses‘ so, as well as being an enjoyable afternoon out of the classroom, Thursday’s class trip to Putney Square tied in with their schoolwork. 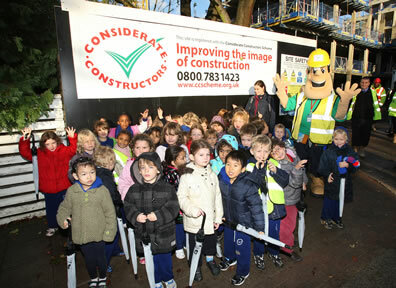 The children, aged from 4 to 6 years old, walked a mile from their school and were greeted on site at Putney Square by ‘Ivor Goodsite’, the Considerate Constructors cartoon mascot. Having been taught about the dangers associated with active sites, the children were equipped with hard hats, high visibility waistcoats and safety glasses. Once suitably dressed in Personal Protective Equipment (PPE), each group was taken around the site of Putney Square. As a result of their outing to Putney Square, the children have been set the task of designing a poster for their ‘Homes and Houses’ project and Brandlehow Primary School have invited Barratt to visit the school in December to look at the work they have produced.